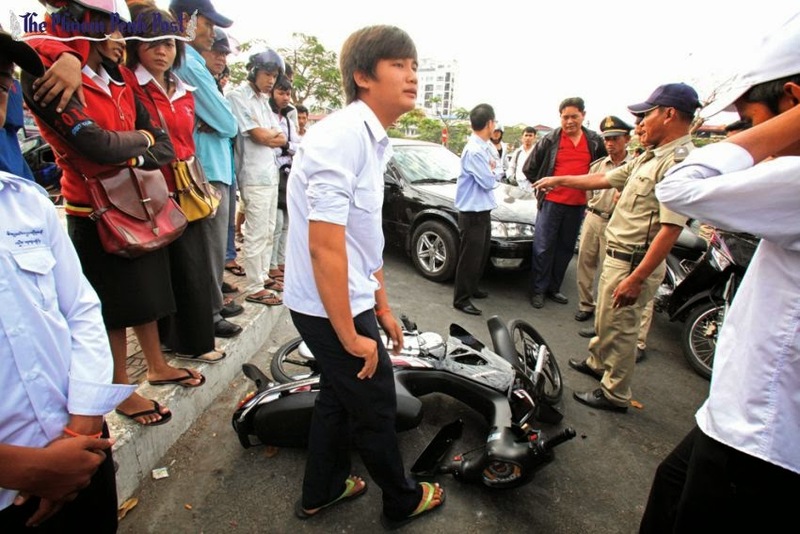 Seven months ago, 31-year-old Phaung Sopheap was driving his motorbike down Street 271 on the western outskirts of Phnom Penh when another motorbike crashed into him. He fell off and landed with his leg trapped underneath his bike. The man who had collided with him then drove over him again in an attempt to finish him off – a well-known tactic to avoid paying medical bills. Before the crash, Sopheap was an electrician and able to pay for his two young children to attend private school and extra English classes. Afterwards, he was unable to work and deep in debt to the relatives who paid for his treatment. The same happened to Chen Boeun in Kampong Speu who in 2010 became the victim of a hit-and-run – his children gave up their studies to find work in garment factories. 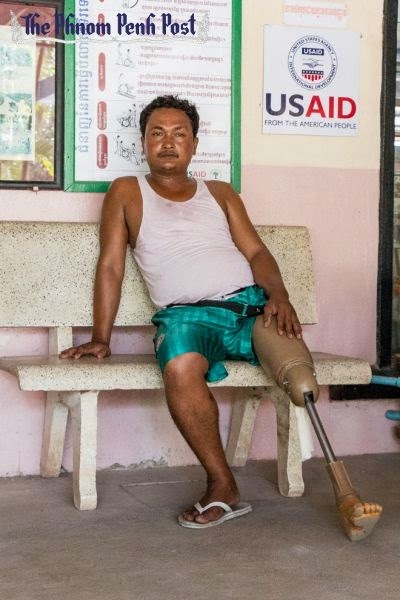 And to Touch Sokun, who had to have his leg amputated in 2012 after crashing in Phnom Penh. He was about to take up overtime work, but his injury forced him to miss the necessary training. All three men are now in debt after becoming victims of Cambodia’s roads – which are claiming and crippling more lives than ever before. Many of the casualties are young men. For these family breadwinners, the repercussions are huge: being unable to work, spiralling into debt, being unable to provide for their families. Some even become dependent on their children. “Road crashes are a new threat to the country’s future, disproportionately affecting vulnerable groups of road users, including the poor,” said independent road safety consultant Ear Chariya, adding that more than two-thirds of the people killed on Cambodian roads are aged between 15 and 44. “Road crashes place a heavy burden, not only on the national economy but also on household finances,” he said. Socheata Sann, a Cambodian PhD candidate in road safety at the Queensland University of Technology in Australia, is conducting research into the effects of road crashes on Cambodian men. She has mainly been working with Cambodia’s 11 physical rehabilitation centres, all of which provide free rehabilitation services to physically disabled people around the country. Two of them are funded by the government, nine through various NGOs. In Sann’s research, she found that, from 1980 to 2011, just 3 per cent of the people treated at these rehab centres were injured in road crashes. But those figures accellerated rapidly in the study’s last five years. For 2007 to 2011, the rate was 15 per cent. The real increase is probably even higher, she said, because there are many road crash victims who do not use the centres’ services. A few months ago, Sopheap was undergoing physical therapy at the Kien Khleang National Rehab Center in Chroy Changvar district, which has fitted him with a prosthetic leg and where a physiotherapist helps him to get used to walking again. Sopheap’s injury was worsened by the perpetrator running over him again. According to Chariya, despite a 2007 law ordering the same punishment for a driver who causes death as one who causes disability, perpetrators remain cognizant that they could still end up paying more compensation should the victim remain alive. “Victims or their family can ask for more compensation to cover their medical costs and long-term care, which would cost more than death as a result of a crash,” he said. Sopheap now attends the rehab centre every morning, and hopes he will eventually be able to drive again, a skill he needs to be able to go back to work. The effects of impairment from road crashes are complex. The cost of medical treatment is high, and many fall into debt. 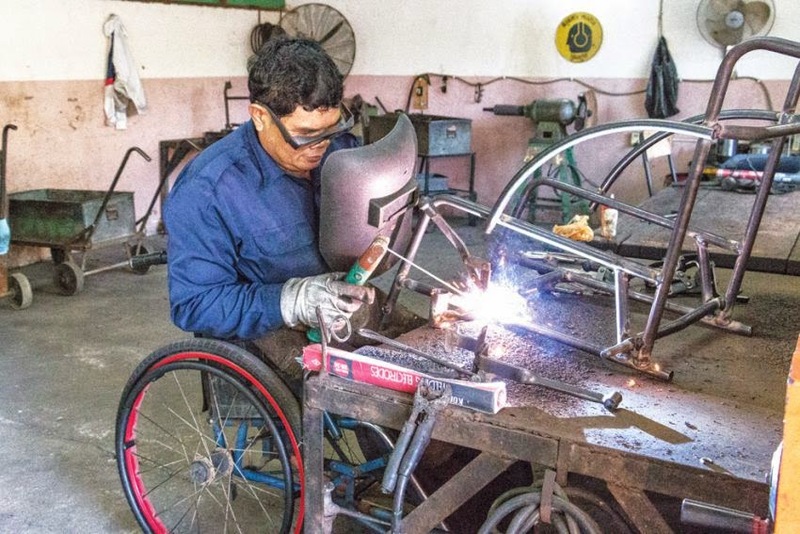 Because of Cambodia’s poor infrastructure, which brings with it a lack of accessibility for the disabled, it can be impossible for them to find work. For people aged between 16 and 60 – a category that makes up 85 per cent of patients injured in road crashes – the economic implications are enormous. “Most people are of working or studying age, and are also the breadwinners of the families. At that age, it affects a lot of areas of their life – the whole family too,” said Sann, adding that the majority of those affected are men, partly because Cambodian men are more likely to drive, and partly because, in her opinion, they are more likely to demonstrate risky behaviour. The poorest are worst affected. Treatment is expensive and, depending on the injury, can last many months or even years. The former breadwinners become dependent on family members to take them. “Mobility is a real issue,” said Sann. 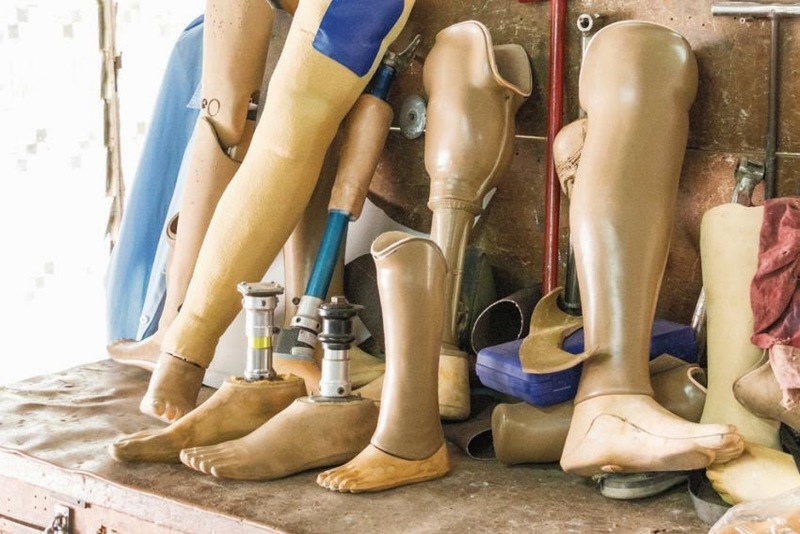 Even if those left disabled have the chance to attend short vocational training courses run by NGOs, these classes may not be relevant, said Sann. “The training courses might be to repair motorbikes or cars, but it’s not really about continuing their long-term education,” she said, adding that some courses include tasks that require heavy lifting, which are not appropriate for many disabled people. “It’s a very good idea to provide skills, but these NGOs need to check first whether they can follow these skills or not, because some of them might spend a year learning a skill and when they start to work for three months they cannot continue to do so, so it’s a waste of time”, she said. As a result, many are left unemployed. Of the road crash victims Sann spoke to, 20 per cent were unemployed, compared with the latest International Labour Organisation figure of 0.20 per cent people nationwide. And if people cannot work, they become reliant on their families. “People really expressed the feeling of becoming a burden on their families, because they are disabled and cannot get a job. Sometimes, their children need to stop their education, or their brothers and sisters need to stop to get a job,” she said. Boeun, from Kampong Speu, sustained broken bones in his hand and leg after the hit-and-run. He used to lead a team of construction workers but had to give up the job due to injuries. While he can sometimes work in construction or on a farm, he only does what he can manage. His family is now reliant on his two children, who support them through working in a garment factory. For Sokun, although the recovery from his motorbike crash is far from smooth, most of his medical costs were covered, partly by insurance from his work at the Ministry of Agriculture, and partly by the perpetrator of the crash. He was also able to keep his job, and they even paid him the same salary while he was off work for 15 days after his operation. “It didn’t really affect my work. As soon as I could walk again, I could go back. While I was recovering, the department paid me as normal, because when I had the accident, I was on the way back from work, so they understood,” he said, sitting in his cramped fourth floor apartment – which he still finds difficult to reach – near Phnom Penh’s Orussey Market. That’s not to say Sokun had it easy. He had intended to take up some overtime work in the agricultural sector in order to earn more money, but missed the training because of his injury. This work, out in rural villages working with farmers, could have made him substantial extra cash to support his wife and three children, he said. He also bought a car that he now drives to work, believing it safer than a motorbike. But it was expensive, and he is now indebted to his relatives.